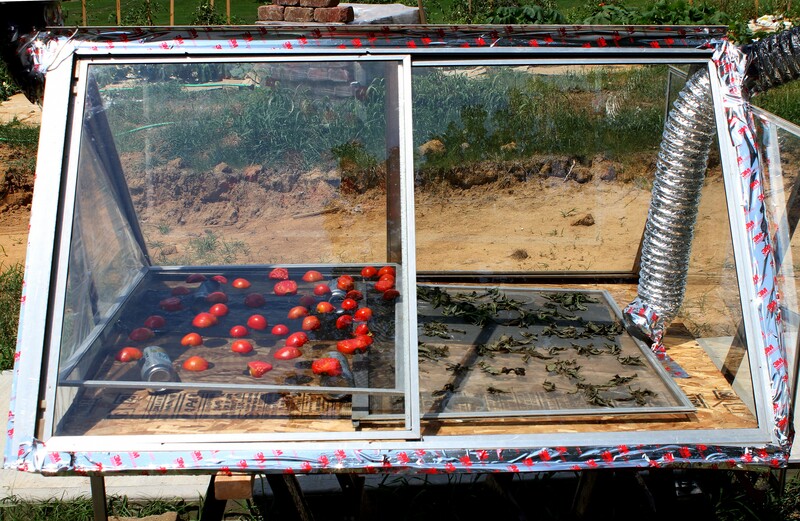 Now that I’ve got a nice crop of my own tomatoes coming on, I’ve been wanting to rig up a solar dehydrator system for drying them. Last week I put together a set of evacuated solar tubes. Didn’t even know if this particular kit, one of six I’ve had sitting around for several years, was for hot water or hot air. I got brave and ran a garden hose in one end. I got my answer pretty quick. Steam started shooting out the other end and water leaked out around every tube. Guess it’s hot air then. Fine and dandy. Yesterday I rigged up a glass window tent and snugged it up against the outflow pipe. Using a little fan, I gently blew air into the intake and was rewarded with a shot of still steamy air the length of my glass tent, 200 degrees F. For the windows, I simply used old storm windows and aluminum frames. It’s great to be able to swing a window open and then click it shut and semi-air tight. I didn’t leave anything to chance as far as fire goes because these evac tubes get darned hot. Burned my fingers on the copper tips enough, even in the SHADE. I bought a roll of metal tape and an aluminum flexible vent as opposed to my automatic reach for duct tape and flexible plastic venting. I attached the aluminum vent hose to my outflow to direct what is hopefully 200 degree F hot air to the bottom of the glass tent. I wanted to go all solar, fan and all, but don’t have access to one right yet. 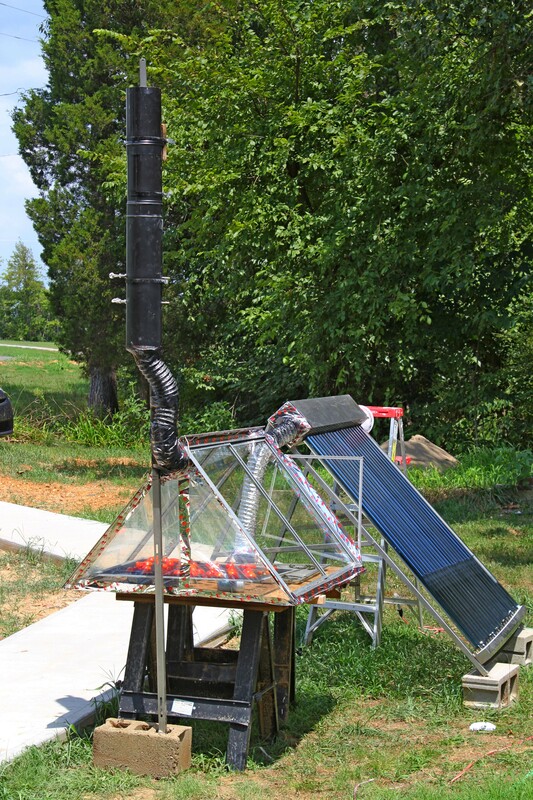 I recalled how a black tall chimney will heat up air on a sunny day, causing the hot air to rise and create a draft- maybe enough to pull air through the solar evac tube system INTO the solar tent and then up through the chimney, taking moisture with it. I rigged up this chimney with left over parts from my wood-fired pizza oven vent. So far, it only gets to 130-140 degrees F, about as hot as the inside of a car on a sunny day. I did take a small fan and blow air into the intake of the solar collecter. It’s now hot enough that I burned my fingers AGAIN pulling the dried basil out. Maybe it’s too hot? Basil leaves took about an hour to dry. Tomatoes are naturally going to take longer, but I can see changes in them already. Since I’m using window screen, (and who knows what sort of galvanized stuff is on the wire) I lightly coated it with cooking oil and will hope for the best. The acid from the tomatoes might etch them as well. Am propping them up off the floor with empty soft drink cans. Just pulled a loaf of banana bread out of the solar cooker. Kids are coming over to go swimming. My son and his friend are cooking the old fashioned way in the kitchen, filming an episode of their version of “Epic Meal Time.” Smells incredible. If you’ve already got the stuff, why not use it? We have such cold springs and cool summers that I just bought a quart of flat black paint for the car project, but I was also thinking that I could collect large (double fist-sized) rocks and use the same paint to coat them black to put around heat-loving annuals like tomatoes. Seeing your idea, I thought maybe you could floor the bottom of your dehydrator with regular red bricks or those flat 8×16″ pavers painted flat black on the tops. I don’t know if the asphalt smell ever really goes away, and sun-dried, asphalt-smelling tomatoes just seems kind of … icky. Then I thought, “Hey, dummy! *I* could use black-painted bricks instead of rocks around my tomatoes! They are flat, easy to stack when not in use, and I could make a sort of pavement around the plants to absorb more heat than just a few rocks. Also, I have some old 5-gallon water jugs (the kind that go in the commercial dispensers) with their bottoms cut off for use as cloches. If I had black bricks around the base of a tomato plant, I could just set the cloche on the bricks, instead of trying to juggle a combination of rocks that fit inside the cloche. AND the black brick paving would help avoid splashing soil onto the lower leaves of the tomato plants, a common foothold for disease. THANKS FOR THE IDEA, TAMRA! 140F may be hot enough. You don’t want to cook them. I, on the other hand, have an old car that I’m going to try using as a solar dehydrator. My old 1985 Chev Cavalier is being gutted across the street. The guy will remove everything but the shell, glass, steering and wheels (for moving it) and drag it back to me. I will park it in a full-sun position and paint the shell with flat black paint to absorb heat. The windows will be left clear, and they will still roll up and down to vent it, or close against rain. It will be interesting to put a thermometer in it and see how hot it does get. If it doesn’t get hot enough, I’ll paint the windows black, too. We shall see. Cooking was my concern as well. Love the idea of using an old car. If it’s just sitting there anyway… My solar dehydrator is too high tech, but I wanted to measure practical usable output.